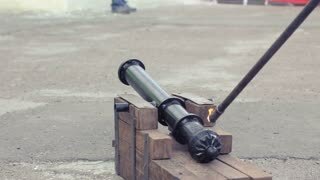 Search Results for "cannon shot"
SAMOBOR/CROATIA-MARCH 06: Salvo of Cannons shot, on March 06. Reconstruction of medieval battles in the first half of the 15th century, in Samobor Croatia March 2016. UNITED STATES 1960s: View from moving car, cannons firing / Tracking shot of cannons firing. streamer cannon firing white streamers over a crowd. filmed from directly behind the cannon/stadium shot. Baseball fans go wild with the t-shirt cannon being shot into the stands. Revolutionary War reenactment. Soldiers arm cannon. Slow motion. Shot on RED EPIC, 1080p HD. DANBURY, CT/USA - NOV 2, 2013. Footage over Cannon Beach, Oregon shot over the coast, viewing rock, waves, town and sunset with DJI Mavic Pro drone. Revolutionary War reenactment. Soldiers arm cannon. Close up. Slow motion. Shot on RED EPIC, 1080p HD. DANBURY, CT/USA - NOV 2, 2013. Pan shot of cannon in Buda Castle in Budapest. SAINT-PETERSBURG, RUSSIA - AUGUST 12, 2016: The cruiser Aurora after a renovation parking on the Petrograd embankment. Close-up shot of cannon. POV Tilt up reveal shot, historic cannon pointed out over a bay on the Caribbean Sea at Willemstad, Curacao. UNITED STATES 1940s: A man and woman are shot from a cannon into a net. UNITED STATES 1940s: A woman climbs into a cannon getting ready to be shot out. Medium shallow depth of field tracking shot of a medieval cannon on the historic city walls of Alghero aiming at Capo Caccia in Sardinia Italy. A steady scenic shot of an old cannon on display. A Close up Shot of an Old Cannon, on a School Trip to a World Heritage Site, Amsterdam.